San Francisco, California, is one of the country’s most iconic cities, known as much for its hills and vistas as for its progressive political climate. Indeed, identification of counterculture movements can be invoked merely by naming some of the city’s neighborhoods, including Haight-Ashbury and the Castro. Today, San Francisco and other Bay Area communities like Berkeley and Oakland are leading the nation’s conversations around questions of police accountability, civic engagement, constitutional policing, police use of force, and individual rights. These are timely conversations because police-community relations in the United States have reached a pivotal moment. Recent highly publicized events involving law enforcement officials, particularly officer-involved shooting incidents, have communities questioning the integrity of police, the rights of individuals, and the role of the community in ensuring that police practices align with community expectations. • In 2015, the SFPD was involved in six fatal officer-involved shootings. • In a 2010 criminal investigation, a series of racist, sexist, and homophobic text messages was found to have been shared among a group of SFPD officers.2 The public was not informed about this issue until February 2014. • In a similar incident made public in early 2016, prosecutors investigating an alleged sexual assault involving an SFPD officer discovered a series of racist and homophobic texts shared among the accused officer, his supervisor, and several additional SFPD officers in 2015. These events have placed the city in the national spotlight regarding policing practices and opened a public and passionate conversation around the SFPD’s community engagement, transparency, and accountability. As the Final Report of the President’s Task Force on 21st Century Policing notes, trust is the key to the stability of our communities, the integrity of our criminal justice system, and the safe and effective delivery of policing services. In response to community outcry after several officer-involved shootings and other high-profile incidents, San Francisco Mayor Edwin M. Lee and former SFPD Chief of Police Greg Suhr requested assistance from the DOJ to help address the significant community concerns regarding the status of policing in San Francisco. 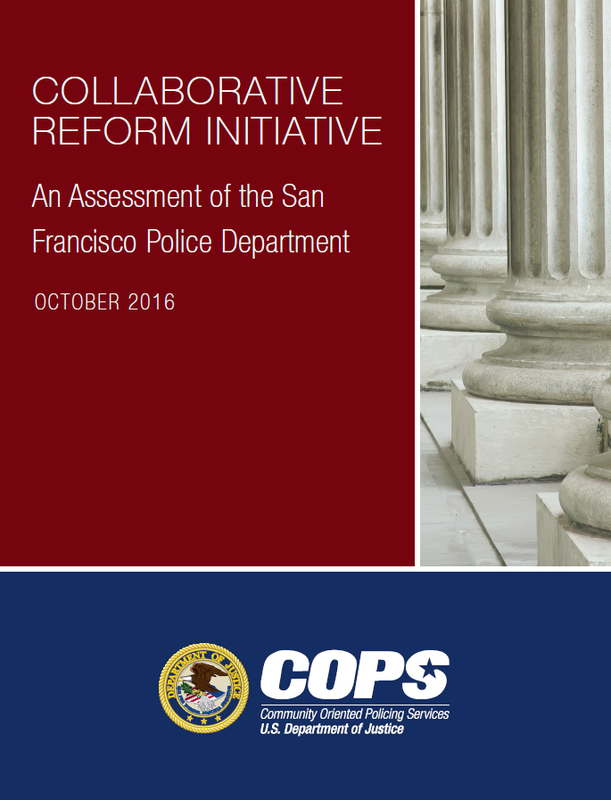 Specifically, they sought an independent assessment of SFPD through the DOJ’s COPS Office Collaborative Reform Initiative for Technical Assistance (CRI-TA). The DOJ COPS Office established the CRI-TA program in 2011 in response to requests from the law enforcement community for a proactive, nonadversarial, and cost-effective form of technical assistance for agencies with significant law enforcement–related issues. The COPS Office partners with law enforcement executives to assess agency needs and tailor an effective technical assistance approach. In San Francisco, the COPS Office offered CRI-TA, a long-term, holistic strategy to improve trust between police agencies and the communities they serve by providing a means to organizational transformation. As part of CRI-TA, the SFPD committed to providing the resources and access necessary to facilitate an in-depth look into its policies and practices to help identify areas for improvement and reform particularly as they relate to use of force. The SFPD and the city are to be commended for taking this important step. On April 29, 2016, the COPS Office and the City and County of San Francisco entered into a Memorandum of Agreement for CRI-TA (see appendix G on page 360 for a copy). The goal of CRI-TA with SFPD is to assess, monitor, and assist the department, in collaboration with the community, in the implementation and sustainment of reforms that increase public trust through improvements in community policing practices, transparency, professionalism, and accountability while taking into account national standards, promising practices, current and emerging research, and community expectations (see appendix H on page 363 for the full statement). The COPS Office found a department that is committed to making changes and working with the community. On the other hand, the department has significant deficiencies in the operational systems assessed. Deficiencies were found ranging from outdated use of force policies to inadequate data collection and lack of accountability measures. We also found disparities in traffic stops, post-stop searches, and use of deadly force against African Americans. In addition, there are numerous indicators of implicit and institutionalized bias against minority groups. Focusing on the five objectives, we identified 94 findings and developed 272 associated recommendations. Following are key findings from each chapter. See chapter 2 for the full narrative. • The majority of deadly use of force incidents by the SFPD involved persons of color (finding 1). • The SFPD does not adequately investigate officer use of force (finding 18). • The SFPD does not maintain complete and consistent officer-involved shooting files (finding 19). • The SFPD has not developed comprehensive formal training specifically related to use of force practices (finding 6). • Community members’ race or ethnicity was not significantly associated with the severity of force used or injury arising from an officer’s use of force (finding 21). See chapter 3 for the full narrative. • The weight of the evidence indicates that African-American drivers were disproportionately stopped compared to their representation in the driving population (finding 30). • African-American and Hispanic drivers were disproportionately searched and arrested compared to White drivers. In addition, African-American drivers were more likely to be warned and less likely to be ticketed than White drivers (finding 31). • Not only are African-American and Hispanic drivers disproportionately searched following traffic stops but they are also less likely to be found with contraband than White drivers (finding 32). • The SFPD did not conduct a comprehensive audit of official electronic communications, including department-issued e-mails, communications on mobile data terminals, and text messages on department-issued phones following the texting incidents (finding 24). • The SFPD’s failure to fully and adequately address incidents of biased misconduct contributed to a perception of institutional bias in the department (finding 28). • Allegations of biased policing by community members have not been sustained against an officer in more than three years (finding 29). See chapter 5 for the full narrative. • The SFPD is not transparent around officer discipline practices (finding 55). • Evaluation of employee performance is not an institutionalized practice in the SFPD (finding 79). • The SFPD’s Internal Affairs Division does not have standard operating procedures or templates for investigation reporting (finding 61). • The SFPD does not analyze trends in complaints, situations that give rise to complaints, or variations between units or peer groups in relation to complaints and misconduct (finding 67). • The process to update Department General Orders is overly protracted and does not allow the department to respond in a timely manner to emerging policing issues (finding 70).